Penn State researchers believe they have developed a 10-fold increase in the ability to harvest mechanical and thermal energy over standard piezoelectric composites. The new system may be possible using a piezoelectric ceramic foam supported by a flexible polymer support. 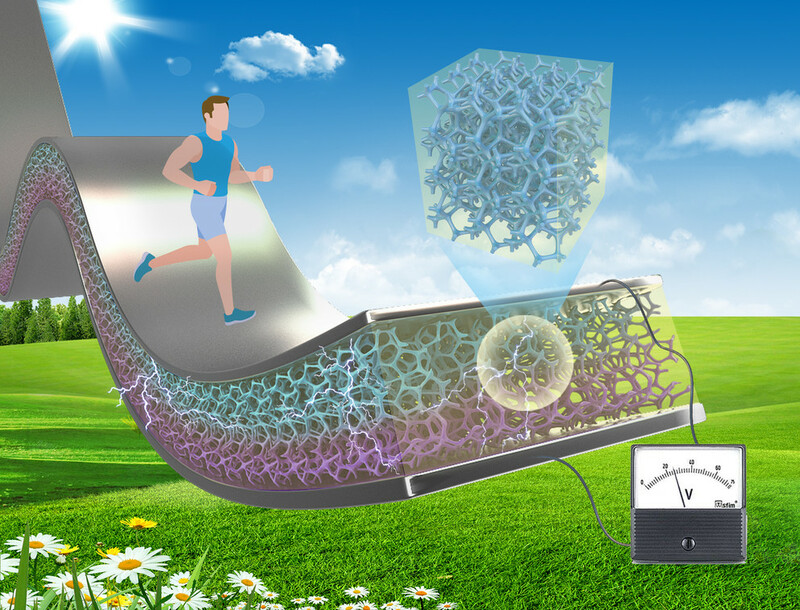 A 10-fold increase in the ability to harvest mechanical and thermal energy over standard piezoelectric composites may be possible using a piezoelectric ceramic foam supported by a flexible polymer support, according to Penn State researchers. Image Credit: The Wang Lab at Penn State. Click image for the largest view. The secret ingredient to solve the mystery turned out to be a cheap polyurethane foam dusting sheet that can be purchased at any home improvement store. The small uniform protrusions on the sheet act as a template for forming the microstructure of the piezoelectric ceramic. The researchers applied the ceramic to the polyurethane sheet in the form of suspended nanoparticles in solution. When the template and solution are heated to a high enough temperature, the sheet burns out and the solution crystallizes into a solid 3-D microform foam with uniform holes. They then fill the holes in the ceramic foam with polymer. Sulin Zhang, a professor of engineering science and mechanics at Penn State is the other corresponding author on the paper “Flexible Three-Dimensional Interconnected Piezoelectric Ceramic Foam Based Composites For Highly Efficient Concurrent Mechanical and Thermal Energy Harvesting,” published in Energy and Environmental Science. Zhang and his students were responsible for extensive computational work simulating the piezoelectric performance of the 3-D composite. There is quite a list of collaborators. Additional authors are o-lead authors Guangzu Zhang, formerly in Wang’s group and now at Huazhong University of Science and Technology, China; and Peng Zhao, a doctoral student in Zhang’s group. Other contributors are Xiaoshin Zhang, Kuo Han, Tiankai Zhao, Yong Zhang, Chang Kyu Jeong and Shenglin Jiang. A 10-fold increase all at once in this field is astonishing and very welcome indeed. If they only get an 8-fold increase is still huge. They may do even better than 10 if the material research gets great results. If low cost enough, there are ideas stacked up for low power devices that could get to market without batteries or other power sources to put a drag on marketability. The researchers applied the ceramic to the polyurethane sheet in the form of suspended nanoparticles in solution. When the template and solution are heated to a high enough temperature, the sheet burns out and the solution crystallizes into a solid 3-D microform foam with uniform holes.